I love apple crumble and so does the rest of my family so here is the recipe I use. You do not have to use Apples any fruit will do, just adjust the amount of sugar used, depending on the sharpness of the fruit. Prepare fruit as would for stewing and layer into a 900ml-1.1l (1½-2pt) ovenproof dish with 100-175g (4-6oz) sugar, depending on the sharpness of the fruit. Rub the butter into the flour under the mixture is the texture of fine crumbs; stir in 50g (2oz) sugar. 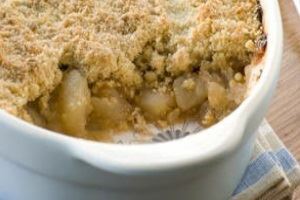 The crumble mix should be a pale golden colour, if very pale add additional butter or margarine. Sprinkle the mixture on top of the prepared fruit (I tend to press the crumble down lightly, but thats just my preference). Bake at 375°F (190°C) for 30 to 40 minutes.